A heavy duty non-rachet tree lopper. A four times pully mechanism makes cutting easy up to 25mm (approx. 1"). For thicker branches a high quality saw is provided, which can be attached to the pole. For ease of maintainence and service all fittings are screwed together. As with all our products, spare parts are readily available. The saw attachment is specifically designed to cut thick hardwood branches up to 100mm (4") in diameter. Made from SK5 steel, the teeth are offset, providing a smooth cut. To lower resistance from the branch itself, innovative holes are set back from the teeth to clean away the sawdust. The saw has bark splitters at the ends to provide a clean cut and the 100% efficient use of the saw. A high quility plasic and rubber handle used to convert your Long-Reach Saw into an hand-held unit. Our Telescopic Poles are made from high strength fibreglass, which allows for safe pruning around power lines. The head pruner and saw attachment have a universal locking device, which is quick and easy to exchange. our large pole with an extension from 203cm (6.6') to 380cm (12.5'). is our small pole with an extension from 136cm (4.5') to 240cm (7.9'). The Nylon Adapter is for use with the Telescopic Alu-Pole (gar-4-5) . The adapter will add even more versatility to our extension poles by allowing you to use various homeware and outdoor hardware products with the poles. Used for dusting around the house, especially for your high ceilings. This duster can be bent to any angle as to be able to reach those awkward spots. A heavy duty ratchet lopper with a 5:1 cutting ratio. It will cut stems and branches up to 45mm (approx. 1 3/4) with ease. For double the cutting power and extra reach, the telescopic handles can be extended to double their length - up to 900 mm (approx 3 feet). For ease of maintainence and service, all fittings are screwed together. The blade is Teflon coated to prevent gumming and rusting. This product is ideally suited for the professional as well as the hobby gardener who demands accurate, easy cutting, strength and relaibility. Power Lopper is our heavy duty ratchet lopper with a revolutionary 5:1 cutting ratio. It will cut stems and branches up to 60mm (2 3/8") dia with ease. A new feature is the ease of exchanging parts. It comes with a safety strap. Replacement Blade for Long Handled Anvil Lopper. 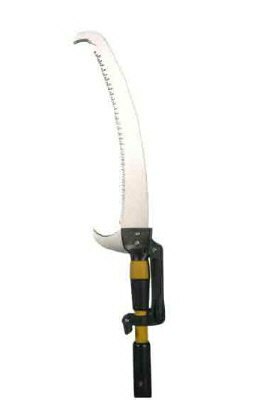 Proprune - nylon /Fibreglass body is our medium duty ratchet pruner. It will cut stems and branches up to 20mm (approx. 3/4") thick. Powerkut Mk IIII is our heavy duty, all metal ratchet pruner for the serious hobby gardener and the meticulious professional. 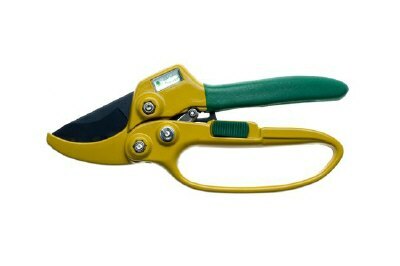 It will cut branches and stems up to 25mm (approx. 1"). All fittings are screwed together for ease of maintainence and service. Extra long life is guaranteed with the fitted brass bush on the weight bearing link, between the upper and lower handles. Powerkut Mk1 is an all metal medium duty ratchet pruner, it will cut stems and branches up to 20mm (approx. 3/4"). Spare Blade for the Pro-Prune and power-Kutt I range. 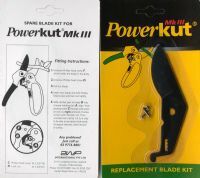 Powerkut Mk IIII Replacement Blade. Mini Lopper is our light weight, quick to use ratchet lopper. 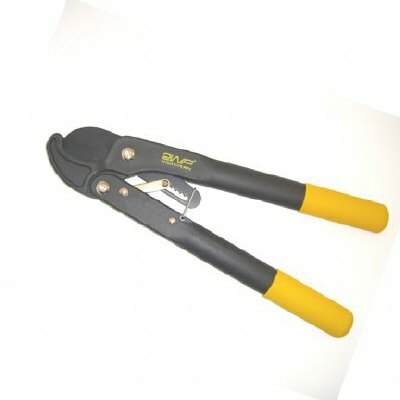 It is able to cut branches up to 28mm (1.1") in diameter. With its increased cutting strength, it is suitable for those that simply want more power than a regular secateur, but do not require the use of our heavy duty loppers. a replacment blade for the Mini-Lopper. The aluminium arms are telescopic extending up to 600mm (24”), giving extra reach in those hard to get to places horizontally and vertically. old lopper blade suits loppers 5 years and older. Keep your tools handy and by your side when you need them. Keep those blades sharp with this special file.